As discussed in previous chapters of this book, virtualization is the ability to run multiple operating systems simultaneously on a single computer system, and a number of different commercial and open source solutions are available. In the preceding chapters we looked in detail at configuring and maintaining Xen based virtualization on Red Hat Enterprise Linux 5. In this and subsequent chapters we will look at KVM based virtualization hosted on an RHEL system. Note that while the above commands only report whether the processor supports the respective feature, it does not indicate whether the feature is currently enabled in the BIOS. In practice virtualization support is typically disabled in the BIOS of most systems. It is recommended, therefore, that you check your BIOS settings to ensure the appropriate virtualization technology is enabled before proceeding with this tutorial. If your processor does not have Intel-VT or AMD-V support you will still be able to install guest operating systems though this will be implemented using the QEMU environment instead of KVM virtualization. QEMU uses emulation to run guest operating systems and as such results in slower performance than the hardware assisted virtualization offered by KVM. Unlike a dual booting environment a virtualized environment involves the running of two or more complete operating systems concurrently on a single computer system. This means that the system must have enough physical memory, disk space and CPU processing power to comfortably accommodate all these systems in parallel. Before beginning the configuration and installation process check on the minimum system requirements for both RHEL and your chosen guest operating systems and verify that your system has sufficient resources to handle the requirements of both systems. Whilst previous versions of RHEL supported KVM on both 32-bit and 64-bit systems, as of RHEL 5.4 support for KVM virtualization is only available for 64-bit (x86_64 architecture) versions of the operating system. Once the channel has been selected, click on the Change Subscriptions button in the lower right hand corner of the web page. 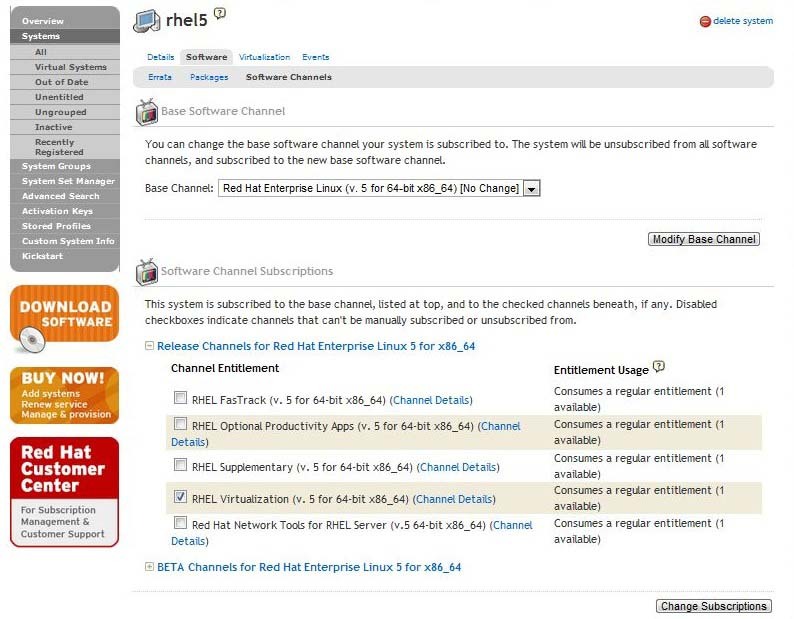 On returning to the system overview page, the RHEL Virtualization channel will now be listed under the subscribed channels. This will force the system to update with the latest channel information. Alternatively, launch the Package Manager by selecting the Applications -> Add/Remove Software menu from the desktop menu system. Enter the root password if prompted to do so and scroll down the list of categories, selecting Virtualization when it becomes visible. If Xen virtualization was previously installed on the system, an error message may appear stating that virt-manager is “unable to open a connection to Xen hypervisor/daemon”. If this occurs, dismiss the error dialog, select the xen entry from the main virt-manager screen and click on the Delete button to remove it from the database.